Honestly, when it comes to Converse I've been really down the last few weeks. That pretty much stems from the departure of "he which we do not speak of," but more so lately because I feel like his departure is symptomatic of a larger issue. However, yesterday something significantly positive happened. Converse rider Rune Glifberg took home the Gold at the X Games in the Skateboard Park competition. 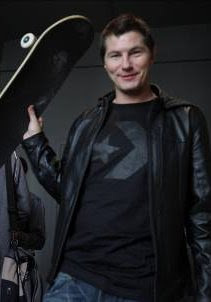 The following 3 pictures from the X games are from ESPN.com and the picture of Rune in the Black Converse shirt is from Converse. Here is video from ESPN with an interview with Rune. Good job by the fine folks at Converse in getting him in a Star and Chevron shirt just in time for the interview. I flipped on the X games just in time to see the Viking from Denmark capture Gold. He's wearing the Converse Coolidge mid which is up on ConverseOne right now. There is also a Rune Coolidge PE for sale, I will post pictures of that shoe soon. Converse Skateboarding really seems to have their stuff together and I can't wait to see how they grow in the coming years. Check out Rune's Converse site at Skate Like a Punk.